This page is a translated version of the page Conway Stewart and the translation is 100% complete. The birth of Conway Stewart is traced back to 1905. The company entered the British market that already saw the presence of several local producers, and owes its success to a clear market choice: to produce reliable products at a small price, which would reach a more wide public. Although the company has never distinguished itself for technological innovations, its pens were good, reliable and reasonably priced, so they had a great success, and their most preminent characteristic was the enormous variety of colors in which they were produced. But the traditional lack of attention for technical innovations and market positioning on the economic production was also the cause of the decline of the company, which was not able to adapt to the advent of the ballpoint pen. With the diffusion of economic disposable ballpoint pens, Conway Stewart fountain pens become too expensive to be used as cheap writing tools, but being positioned on the economic side of the market they cannot be also used ad objects of distinction. So the company suffered an inexorable decline and in 1975 was closed. 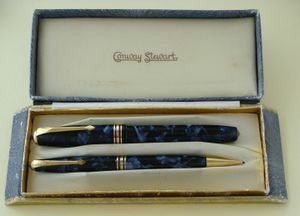 As happened with many other historical brands, Conway Stewart was resurrected in 1998 to exploit the prestige of their trademark in the production of modern pens. 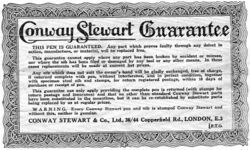 Conway Stewart was founded in 1905 in London by Francis Charles (Frank) Jarvis and Thomas Howard Garner with headquarters staff at 13 Paternoster Row. The origins of the name are not so clear, the most common version tells that it was inspired by the names of two actors that recited at the Collins Music Hall in Islington, and adopted for commercial reasons (it seems it sounds better than Jarvis Garner). The company started its business marketing, in 1906, American pens named Self Filling and Self Cleaning Post; the same year Stanley Jarvis, brother of Frank, joined the company. In 1909 the company was incorporated as Conway Stewart & Co. Ltd. The initial production, on which there is very little information, was made by eyedropper hard rubber pens, produced in the plant site of Upper Thames Street, in London. Despite the presence on the market of already well established companies like Onoto and Swan, and in the absence of specific skills in the technological innovation field, Jarvis and Garner proved to have good business skills, and identified for the best the market positioning of their company. They concentrated into the mass production of a reliable product sold at a lower cost than competitors, in order to meet the growing demand and enlarge the market, a position that will not change in the history of Conway Stewart. In 1919 the first lever filler and safety models were introduced, the following year the brand The Conway Stewart was officially registered (with the number 407502). In 1922 new models were introduced, including the Dinkie, which will become the most famous product of the company (so that the name became a registered trademark in 1924). The Dinkie was a small and functional pen, which was produced in different versions for over 40 years. In 1924 Conway Stewart was the first British company to sell celluloid pens, The use of celluloid, for the variety and richness of the colors they used, is one of the distinguishing features of this brand. The classification of Conway Stewart models is extremely complex, although since the '20s the company started using names, all the pens were still identified by a number and sometimes only by that. In the '20s the top model (which will remain so for two decades) was the Duro, a large pen, then there was the small and functional Dinkie, and the economic Universal. Other models made in the same period were the Pixie and the Dandie. After the first years almost the entire production of Conway Stewart were lever filler pens, but in 1927 the company also produced some button filler models that sells at the same price of the lever filler ones, which remained the most diffused. Until the late '20s pens had the conventional flat top shape with cylindrical body and flat ends, while the cap had an hard rubber head. The pens were produced with or without cap rings according to their price level. Initially, the clip was fixed on one side of the cap and had a ball tip. The company passed the great financial crisis of 1929 without too many problems; profits decreased for the sales decrease, but having concentrated its production on economic pens helped to overcome the worst phase of the crisis, just in 1934 Conway Stewart was again making rising profits. In 1935 the Conway Stewart & Co. Ltd was voluntarily closed to create a new company listed on the London Stock Exchange. The Conway Stewart production was still characterized by the colors used in their celluloid pens. 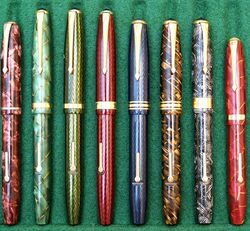 Apart from the classic black the company began to sell a wide variety of colored pens, well beyond the classic marbled colors typical of other companies. Even though there are no official names, some names have become standard between collectors, like the Tiger eye, the Cross hatch, the Herringbone or the most famous Cracked ice (black with thin white veins), which was introduced in 1934. In this period Conway Stewart fountain pens were produced with different style, following the trend of streamlined pens popular overseas. In 1932 a new washer clip was introduced, very similar to the Duofold one, that was locked on the cap by an hard rubber head. In 1935 a new clip with a diamond shaped tip was introduced, that became a characteristics of Conway Steward pens for all the following years. In 1940, following Vacumatic success, a model with a transparent section to control ink level was offered, but because the war it was not a great success. During the same year were also introduced piston filler models added to the traditional lever filler and button filler ones. Despite the heavy bombing the Conway Stewart factory remained almost miraculously unharmed and at the end of the war the company was immediately capable to resume production. After the war the new models from Conway Stewart were built with a more streamlined shape and in a huge variety of colors, a characteristic that this will become one of the distinguishing marks of the company. The new models had a new clip, it was always a washer clip with a diamond shaped tip, but it was locked in place by click button similar Jewel of Vacumatic. At that time were also produced some pens for export (mainly addressed to the Benelux market) under the brand Le Tigre. After the war all the models were identified only by code numbers, with the exception of the Dinkie that continued to use this name. Unfortunately this does not allow any simplification of the classification of Conway Stewart pens, because the choice of these code numbers never followed any sequence or any chronological or logical order, and also they often used different codes depending on the destination of the pen (as if it was intended for the export or not). In 1949 the 58 was launched as the top model, who was replaced in that role the following year by the 60. 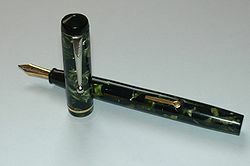 In the mid of '50s Conway Stewart was at the top of its success, and in 1954 the company introduced the prestigious 100 model, a large dimension pen. In this period the first ballpoint pens began to appear on the market, they were expensive and unreliable, but the company continued to ignore them and this traditionalist attitude was fatal. The company also was late in the use of the new plastic materials (introduced only in 1957) and never followed the stylistic trends of hooded nib pens launched by the Parker 51. The company maintained its policy to produce good quality modest priced fountain pens using traditional and well established methods. But if in the first half of the '50s an economic lever filler fountain pen with a screw cap was just a little old-fashioned, but perfectly functional, in the second half of the '50s and in later years it became more and more backward and unable to find a place on the market, faced by disposable ballpoint pens sold at much lower prices, against which the company was unable to compete not having the ability to characterize his products, always placed in the lower end of the market, as distinctive or fashion objects. Despite some revival attempts, and the production of some ballpoint pens, the move to cartridge fillers and the production of some economic hooded nib pens, the inexorable decline continued for all the '60s, until the final closure of the company, occurred for bankruptcy, stated by an order of the High Court of Justice dated 21 June 1975. ↑ the date is uncertain, someone makes it go back to 1920 (see this reference), but this is what the company says on its website. ↑ someone dates the use of celluloid (as the creation of Dinkie) back to 1920, challenging the primacy of LeBoeuf. This page was last edited on 16 December 2018, at 19:22.